Claiming to be as bright as an LED TV and with 40-60% improvement in black level, Samsung's latest F8500 Series is full of surprises. With the kind of design that its designers simply couldn't get away with on a run-of-the-mill living room TV, this totally gunmetal-gleaned 51-inch telly has a D-shaped curve emanating from the front of the TV that acts as a desktop stand. Blimey - now that's a brave move. It all leaves us a bit nonplussed, not only because it's verging on industrial sculpture, but because the realisation dawns that the 51F8500 isn't designed to be hung on a wall. Samsung is probably banking on most home cinemas using AV furniture to support a TV, though an idea does cross our mind; why not stick the 51F8500 in the bedroom and hang your towels on it? It might or might not have the 360 degree that ensures a completely clean, cable-free view from the back (as featured on Samsung's brand new F8000 Series of LED TVs), but the base is the same concept throughout, and curves outward from the back, too. Meanwhile, on the top is a pop-up camera to power two-handed gestures to zoom-in and swipe your way through the GUI. 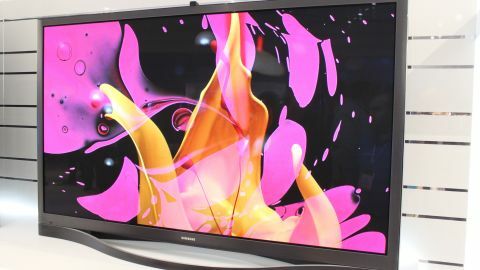 If nothing else the 51F8500's ambitious design marks a re-statement of Samsung's confidence in the oft-ignored plasma tech, which is a tad surprising given its runaway success marketing LED-flavoured sets over the past few years. However, it does lens some validity to Samsung's insistence that active shutter 3D - which is included here - is thee only way to go. With a new Real Black Pro panel promising eight times the black levels seem previously, Samsung is hugely bullish about the 51F8500's chances. "We're hoping that this will set the standard for plasma in the TV industry," said a booth attendant, though what's immediately noticeable is just how searingly bright the white areas of the image are. "With this plasma we've worked on improving the picture quality of the plasma's cells," said Dilen Thakrar, TV Product Manager at Samsung UK, citing the 51F8500's use of a new Super Contrast Panel that improves black levels 40% in a darkened room and 60% in a light room. "We've improved the luminous on this plasma by 250 per cent so now it's at the point where it's equal to LCD. We know that there are real plasma lovers out there that love the technology, love the picture quality and deep black levels, and for us it was about making the best plasma we can - and that's what this is." Samsung UK confirmed to us that it's going to have two sizes of the F8500 Series in Europe - the 51-inch and 64-inch models - though we spotted a 60-incher alongside those two on the show floor. For now it's intended only for the US market.